We are very excited to announce that we are offering our third Youth Social Action Camp, a two night sleepover conference at Camp Barnard. We are inviting youth to explore why sexualized violence and exclusion happens, identify issues that are relevant in their local communities and create youth-led social action projects to address these issues. Specifically, we’ve heard that lots of youth are curious about how to challenge cyber violence (such as bullying that happens online or the non-consensual sharing of photos). 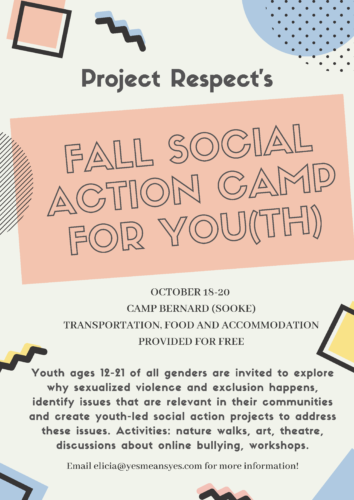 There will be opportunities to explore social issues and action through theatre, art, media, discussions, nature walks, campfire circles (weather pending), games, and other activities. Camp will be facilitated by youth and adults, and led by the desires of participants! You can start the registration process by filling out our online form and we’ll be in touch with the rest of the registration form. We would greatly appreciate if you could share this opportunity with your networks! Here is the Facebook event. If you are an adult who works with you and you think that youth in your programs would be interested in hearing more, we would be happy to attend one of your sessions to share information in person. Accommodations: Sleepover-style common sleeping areas in a heated lodge. We will provide mats and can provide sleeping bags for anyone who doesn’t have one. Food: Everyone at the conference will have the opportunity to help prepare meals. If you have any special dietary requirements, please indicate that on your registration form. For more information: contact Elicia at Project Respect (elicia@yesmeansyes.com).